Airplanes Are Regularly Struck By What? Earth’s oceans are vast and packed with some pretty huge creatures, but we tend to associate behemoth sizes with creatures like sharks, whales, and such—the heart of a blue whale, for example, is as large as a small golf cart (weighing 400 pounds/180 kilograms). Floating out there in the briny depths, though, are some absolutely monstrously-sized jellyfish. 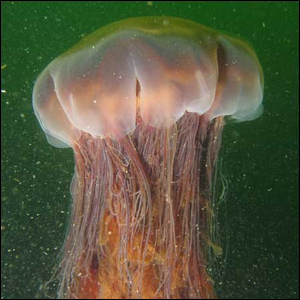 While some of them are large, to be sure, like the portly and aptly named barrel jellyfish that looks like a bright blue futuristic ottoman, there’s a clear winner in the contest for biggest in class: the lion’s mane jellyfish. The lion’s mane jellyfish is so large, in fact, that it is considered a top contender as one of the longest animals on Earth. The largest specimen ever observed washed up on the shore of Massachusetts Bay and had a bell 7.6 feet (2.3 meters) in diameter and tentacles that stretched out to an astounding 121.4 feet (37.0 meters) long. Image courtesy of Dan Hershman.